August’s NFP Numbers: A Case for QE3 and More? Friday’s fireworks are over and after blowing through the smoke, it isn’t quite as pretty a sight as the markets were expecting. Yes, the non-farm payrolls report showed that the labor market added a seasonally adjusted 96,000 jobs in the past month, but this was much worse than the projected 125,000 uptick. Digging deeper, we can see that all of the jobs gains were from the private sector, as companies added 103,000 jobs to the work force, while the government laid off 7,000 workers. 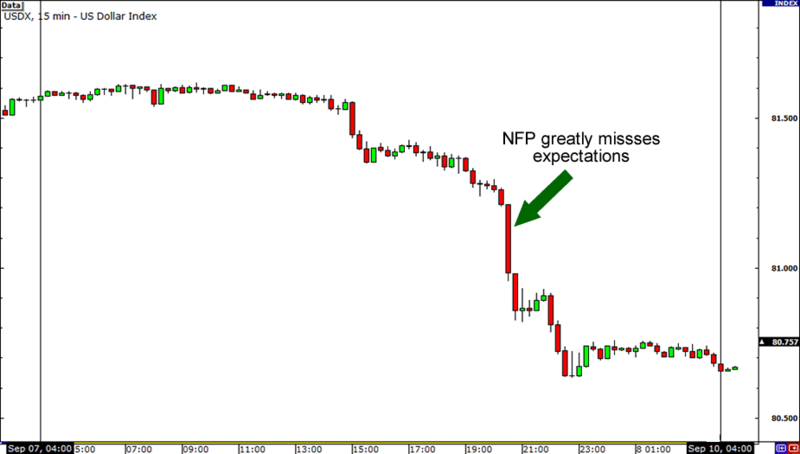 Furthermore, both June and July’s NFP figures were revised lower. July’s report was downgraded from 163,000 to 141,000, while June’s numbers were changed from 64,000 to just 45,000. The only bit of good news was that the unemployment rate decrease from 8.3% to 8.1%, but even this had a murky cloud over it, as the improvement was due to a huge decrease in the participation rate down to 63.5%. Apparently, 370,000 people decided to stop looking for jobs and dropped out of the job hunt, bringing down the participation rate to its lowest level in 31 years! Naturally, all of the bad news led to speculation that the Fed will finally announce additional quantitative easing measures at its FOMC meeting later this week. USDX, an index tracking the dollar’s performance against a basket of currencies, fell below the 81.00 handle and closed near its intraday low after it had consolidated at the 81.55 area early in the day. Recall that in my “The NFP and its Impact on QE3” article last week, I pointed out a possible break below the 81.60 handle if the NFP disappoints. If only I had taken my advice! Worse-than-expected NFP release? Drop in the participation rate? Revisions of past data? That doesn’t sound at all like a SUBSTANTIAL and SUSTAINABLE STRENGTHENING of the situation! Quite the opposite, in fact! Seeing as how Ben Bernanke has focused on the state of labor market and even said that high unemployment figures are a “grave concern,” it’s no surprise that many market players feel that the time is ripe for the Fed to finally light the QE3 match. And why not? ECB President Mario Draghi has certainly done his part in stepping up to ease investor concerns. Recall that just last week, Draghi boosted risk sentiment when he announced the ECB’s Outright Monetary Transactions (OMT), a program that would enable the ECB to buy short-term bonds without limits as long as a financial troubled country formally asks for bailout help. This time around market players are expecting the Fed to not only to increase its monetary stimulus through QE3, but also to extend its period of low interest rates. Others believe that the Fed’s plans will also include lowering its RRR or using its discount window. On the other hand, some naysayers believe that with the Presidential election ahead, the Fed may simply buy more time by reiterating its commitment to do more and launch QE3 after the elections instead. What do you think? Will the Fed give in to pressure and pull the trigger on QE3 in its FOMC meeting on Thursday at 4:30 pm GMT, or will it buy more time and wait for a few more weeks? Will the Fed announce QE3 this week?